The Cold Fire burning in Yolo County east of Lake Berryessa grew to at least 4,700 acres and was 15 percent contained Thursday, according to Cal Fire officials. 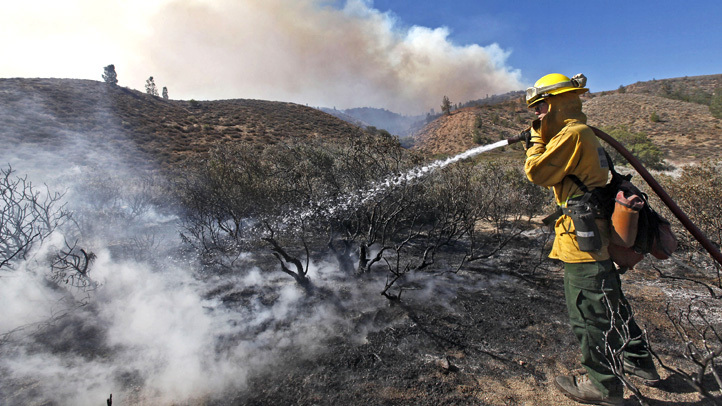 The vegetation and oak woodland fire near state Highway 128 was reported around 4:30 p.m. Tuesday. PG&E high voltage lines along Highway 128 remain threatened, Cal Fire officials said, noting that more than 800 firefighters are battling the blaze as of Thursday. They have at their disposal 80 engines, 21 dozers, 14 water tenders, eight helicopters, and six air tankers. 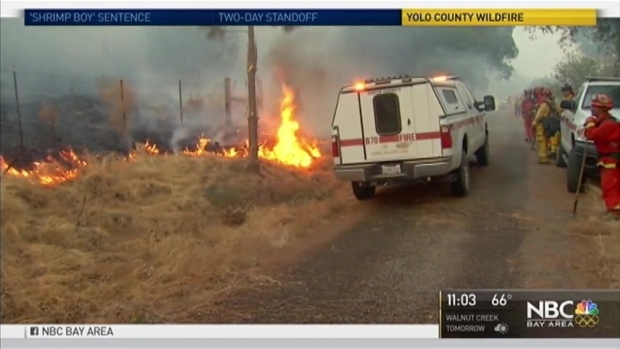 Evacuations have been lifted in Yolo County. Pete Suratos reports. Carolyn Hillegeist expressed relief Thursday, after riding out a scary night at the Canyon Creek Campground where she works. The Cold Fire crossed the containment line late Wednesday afternoon, igniting a nearby hillside and burning awfully close to the campground. "Last night's flare up came right down to the cabins," she said. "We just thank the Lord and everyone who helped." Officials said wind caused the fire to spread Wednesday. According to Cal Fire's Amy Head, "That, last night, was the height of it." Crews have been hammering the hillside from the air, and the situation looks much better. "It's like 99 percent better than it was this morning," said camper Jamie Lowe. "I can finally breathe." The danger, however, isn't over. Officials say firefighters are working to build a containment line around the fire. However, they are battling flames amid rugged terrain and erratic winds. "It's very, very steep back there, as everyone knows, so anything can happen, like we saw yesterday," Head said. "There's still a long road ahead of us." It has admittedly been tough for residents as the Cold Fire ravaged parts of Yolo County, but many say they have lived through similar situations in the past. A big wildfire hit in 2014 and the Wragg Fire ripped through the area in 2015. Residents and campers remain grateful for firefighters' quick and strong response, year after year. "I say, 'Thank you, thank you. You did an awesome job,'" Hillegeist said. "None of this area would have been preserved had they not been here." Highway 128 is closed from the Monticello Dam at Lake Berryessa in Napa County on the west to Pleasants Valley Road on the east. Cal Fire officials hope to reopen the roadway soon, but don't yet have an estimate of when that might be possible. Evacuations remain in effect at the Canyon Creek campground, but Cal Fire officials said Thursday morning that residents could return to Golden Bear Estates, north of Winters. An evacuation center has been set up at 700 Main St. in Winters.